This is informed from the work by Kelly and Johnston (2001). However, I have made significant re-formulations of their work, summarised below. Please click the diagram to enlarge and read it, hit the return button to come back here. Each type of relationship is a whole attachment system and includes elements of its preceding type. 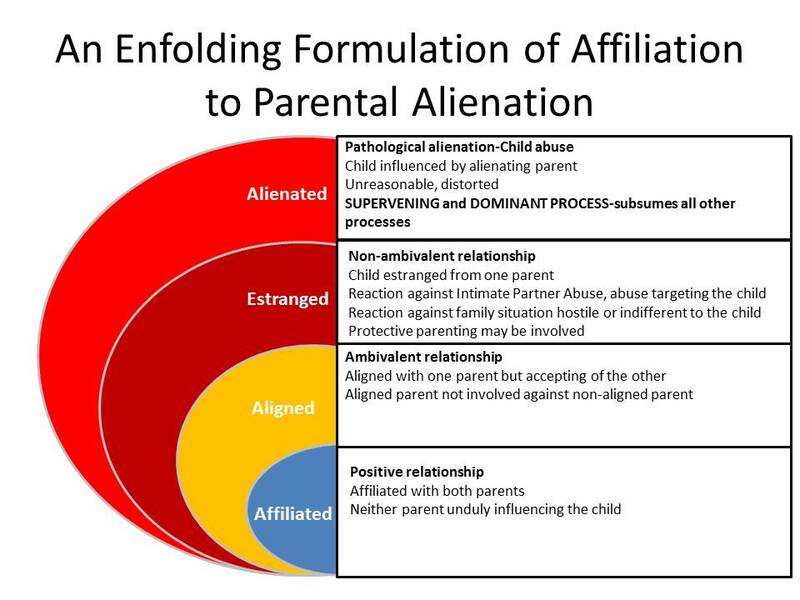 At the extreme end, parental alienation then becomes the SUPERVENING and DOMINANT process. This means that children are extremely sensitive to the actions of an alienating parent, more so to any other influences. For example a child may be aligned with a parent, against the other parent. Perhaps because the non-aligned parent has certain parenting styles that the aligned child finds difficult to deal with. This child seeks comfort with the other parent who then deliberately exploits the situation to rupture the relationship between the child and the non-aligned parent. This is now parental alienation. 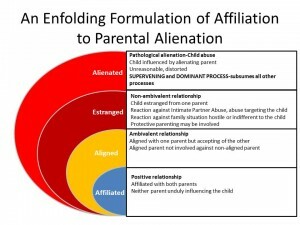 Whilst we have to deal with the original causes of the alignment (because this may be the only way of repairing the relationship between the child and the alienated parent) our first priority is to stop the alienation process. This is because the process of alienation reinforces the original causes of alignment. If we focus only upon the original cause of the alignment then the alienating parent will either sabotage that process by over inflating minor issues or find another angle to exploit for the purposes of alienating the child. Parents who are not in a hostile relationship focused upon each other or not in a relationship where one parent is excessively focused upon the other at the expense of the children would generally work together as co-parents or at least in parallel parenting, even though they may not entirely agree on how to resolve issues of alignment. Such parents whether they are together or separated focus upon the best interest of the children and support a relationship between the child and both parents without feeling threatened. The challenge for parents who believe they are alienated from their children, alienated children, legal and psychological professionals is to differentiate between the forms of affiliation and attachment styles without falling into the “hybrid” trap.